When I first became interested in knotting, I searched the Internet for different books on the subject. 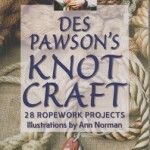 To be quite honest, I had gathered quite a few books on knotting, but many of these books lacked a little something. These books would show me how to tie different knots, so I was becoming quite skilled in tying individual decorative knots. However, one problem that I faced was how do I produce an item consisting of various different knots. I remember once buying the rigging Handbook, only because within the book there was a small section on how to produce a knife lanyard. What I’d really done was spend a lot of money on a very technical book, just for one little section on how to do something fancy. My first ever book which was given to me, was the Ashley Book of Knots. To be honest, this is my favourite book and I will never be parted from it. But, although it is a beautiful book with almost every single knot in the world listed, it certainly is not a book for a beginner. Or maybe it was just me, I felt I had all the knowledge, but just did not understand what to do when reading the book. So after spending a lot of money on different books, and also ending up disappointed with my purchases. 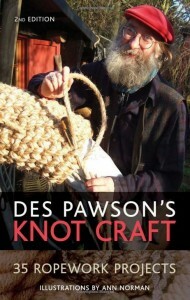 I discovered Des Pawson’s Knot Craft, and this was the actual book I had always been looking for. 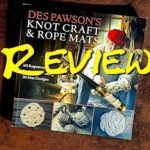 The book is well written and has some beautiful illustrations, guiding you through different knotting projects. A picture and a description of the project to be completed. A full descriptions of all the knot that will be used for the creation of the project. Now this was the bit that I really liked, as there is nothing worse than progressing and then running out of line! So you are not only told what thickness of line to use, but also what diameter to use. 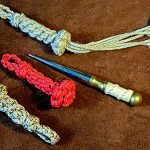 This gives you a fantastic description on how to construct your knotting project. So to be perfectly honest, if you are starting out in the world of knot tying, then this really is the book for you! I have now been knotting for a number of years and I still on occasion dip into this book for ideas and also to remind me of how to tie certain knots. 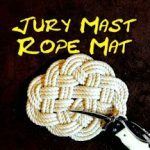 I am ex RN(CPO MW) and think I know my knots. However a running turks head eludes me. I have a specific need to learn this as I have a charity project. Can you help? I am willing to travel from Weumouth for a lesson!! Do or did you ever come across Alan Mills? We were both at school together and we joined the Navy at the same time, he went MW and I settled for being a Stoker. Over the years I would run into him in Vernon and Portsmouth Dockyard. Anyway back onto the real problem, the Turks Head. Actually there is a branch of the IGKT that meet in Weymouth, maybe one of those members would be able to help you out? The person to contact is Peter Goldstone mentioned in this event Knotting AGM His telephone and email are listed there also. If you have any problems, please do get back in touch. Regards, John.